Have you ever been curious how your last house looks now? When we sold our house 5 yrs ago and retired, we decided to downsize. (Still trying to adjust to that decision.) We sold our house to a couple that she said she was an interior designer and liked the bones of the house. I have always wondered what she did with it. Well, it recently went up for sale again and I saw it on Multiple Listing with these pictures of 2 rooms. Now the listing said the house had been decorated professionally. 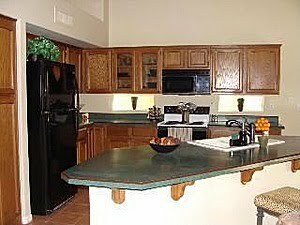 This is a picture of the same area of the kitchen when we lived there and sold it. My decorations may not be everyone's taste and I am certainly not a professional, but I still like the way I had it better. 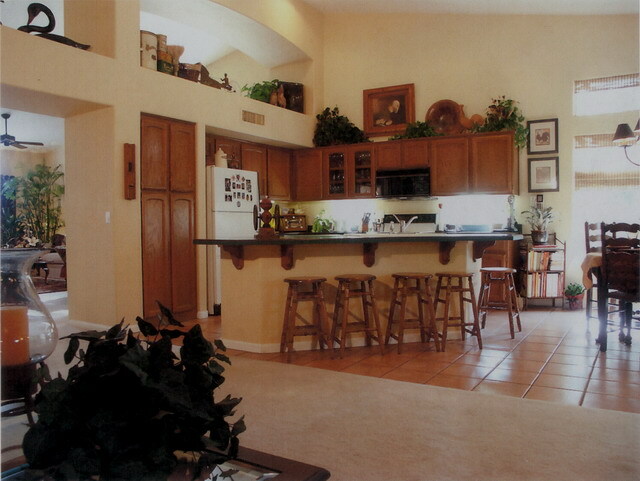 This is a picture of the breakfast area to the right of the kitchen. 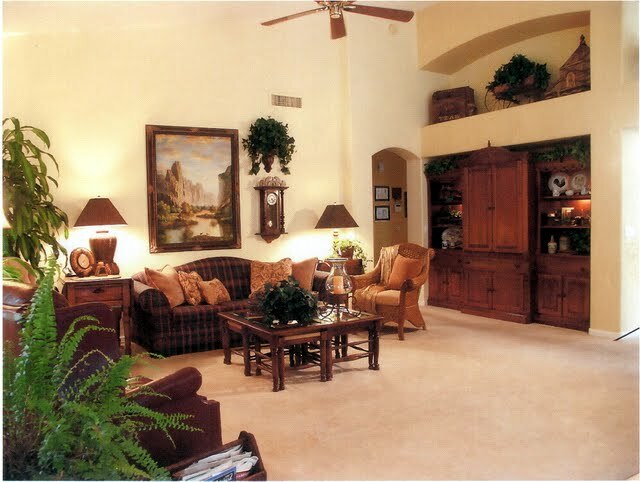 This is their picture of the familyroom that joins the kitchen as one big open room. A picture from the same angel when we lived there. I still like mine better. If you've followed my blog you can see I still have all the same furniture and accessories. This shows a picture of the other side of the familyroom. I have to admit I was a little disappointed when I saw the pictures. I don't know what I expected, but I really thought it would be a little more grand. Have you ever been back to see one of your previous homes and what did you think? Hi Marty - I wonder what kind of "decorator school" she went to? Because honestly, your pictures looked so much better - from every angle - seriously! There is really nothing to compare to. I can't say that I've ever been in any of my old houses, but I think it would be interesting. Oh, and your blue and white tablescape down there - absolutely gorg!! Love it! Maybe she has been watching design to sell on HGTV, they often tell them to remove alot of the decor when showing to show the bones of the home. You had it looking goregeous! Your style is much more inviting...perhaps she has moved everything to give it that open look for a easy sale......maybe..
Hello Marty, newer to your blog. I have to say I am with you on this. Your decorating is beautiful, warm, cozy, welcoming. My husband is a real estate agent. He would love how you have everything. Beautiful!! I don't remember going back to see any of the homes, I've lived in, as an adult. This is only the second home, J and I have lived in. The first one, we owned, was part of the farm and was bulldozed to make room for a subdivision. Yes, we went back once to see it...all that was left was a pile of rubble. Once was all we needed to go! Your decor is gorgeous Marty. Loved all your photos. I wonder what the new owner did to the home, before it was staged for sale. It would have been interesting to see how she really decorated it. Makes me wonder about her design background, seeing it this way. I think YOUR version of the house is MUCH prettier. Her white walls and bare minimum furniture don't do the home justice. Even if she "decluttered" for sale...it just doesn't have the warmth that you had. I've never been back to any of my old homes but saw my grandparents home (who passed away when I was in grade school) on MLS and it was TOTALLY different than what I remembered. Lots of additions, etc....plus it had been almost 40 years since I'd seen it. The outside was very much the same but the inside...not so much. ~WOW! I adore the openess and high ceilings in your old home Marty! You had it decorated very well. Loved it! Hands down Marty, yours is better and I mean it! Wow what a beautiful home it was when you were the owners. Now it's just sort of bland the way they have it decorated, you would have thought she had big ideas.....but maybe she petered out like many of us do on grandiose dreams? lol! I hope it didn't make you miss living there seeing the listing!? I have not seen any of my homes since we moved.....I don't think I would want to either. Have a great day! Marty, I'm a decorator and a stager and trust me-your look was SO much better. I'm thinking maybe they're moving because she couldn't get any work. It looks like a builder basic that has no personality. I'll bet that house misses you! Yes, I liked it better the way you had it, too. I like a house to be "dressed". What probably happened, though, is that the new owners, when they got the house ready to be photographed and put on the market, was to strip it of decorations and ornaments and repaint, so that it would look "generic" to prospective buyers. Prospective buyers don't necessarily like to see other peoples' decorating, preferring to see it plain and imagine it with their own stuff. A professional decorator would know this before she put the house on the market for resale. So, she may very well have had it nicely decorated, too, and took it down for the realtor's picture. Surely they removed everything and did not live in the plain version! But Marty your decorating would be hard for any "decorator" to improve on....you have The Touch! That is a beautiful home, I know you hated to leave it! De-personalization they call this when they strip the house of all it's owners taste so that a new buyer can see themselves living there. I do agree with all the others, though--your style and taste is great...even compared to what the new(er) owners left to stage!!! Wow! Marty, your home looked much better when you lived in it! Hers is lacking warmth and personality, whereas yours is warm and inviting. I cannot believe a "good" interior decorator lives in your old home! 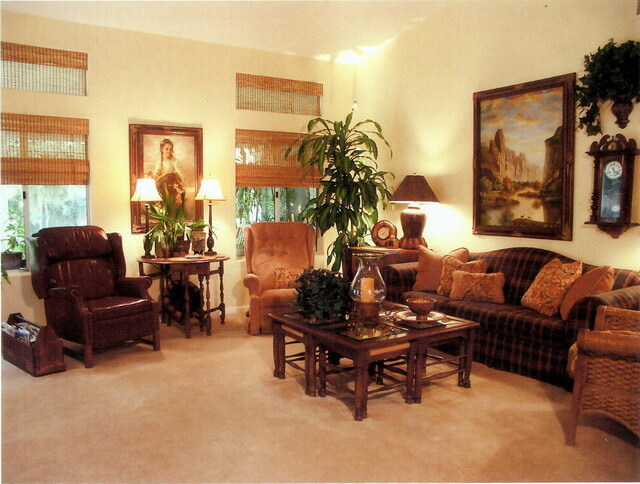 Even if the house is for sale, a decorator would know to have some greenery to add some warmth to the space. The lamps on the sofa table are mismatched and the scale of accessories there are not decorator-worthy, not to mention the furniture! If I was a buyer looking at your pics and their's, I wouldn't even think it was the same home. When you listed your house back then, did you leave it decorated as it was? If so, I'm sure that it must have sold quickly - everything is gorgeous! We've lived in the same house for our 27 years of married life and my parents still live in the same house I grew up in! There is no comparison with how it looks now and what it looked like when you were there. Your style was warm, inviting and very beautiful. The new owners look is cold, bland and stark. It doesn't even look like the same house. I bet that poor house misses you. Whew! If I was the listing agent, I would be on the phone with you in one big hurry to get your pictures!!! Marty, your home was beautiful...and now it will be hard for the average person to see past this sort of "decorating"? Curiosity KILLED my cat, just once ... for all the TONS OF $$$ we spent in restorations, improvements, etc. ... one time I went to view my first home & just about threw up! Disaster! Extensive gardens destroyed, etc. I will say, I liked your decorating much better. Friend you haven't lost your touch, still PURE PERFECTION! But you know when we sold our house in SC. 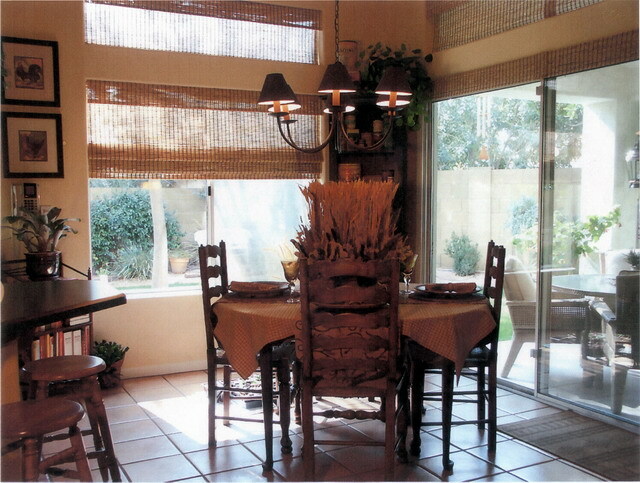 the listing agent wanted my house to look just about as stark. She even wanted part of my furniture out of the house. That was nine days of hard, cold living. Glad the house sold fast. I so appreciate your visits to my place, and your words of encouragement. You help me to keep moving ahead. Wow, Marty, I'd say you knocked their socks off! I suppose everone has different styles and tastes, but I sure hope the owners didn't pay much money for that "professional" decorating! Everything you touch is always gorgeous! All the above comments pretty much sum up what I was thinking Marty! I have been back to visit some of our past homes and always been disappointed. Either people just don't try with their homes, or they try but just haven't got "it". You most certainly have "it"! Now you show images like that and you'll just have to come over for tea and inspiration. No Contest ! ! ! I've learned, never go back ! ! I was expecting to see something that would knock my socks off. Needless to say, I was disappointed. The rooms looked beautiful when you lived there. Just shows the difference between a HOUSE and a HOME. Oh, Marty! Your former home was so much prettier with your things and your touch. Hope it doesn't make you sad! Whoever is supposed to be the professional living in your old home, but have failed the test! As soon as I saw the photos I almost gasped! We lived in almost identical homes when we lived in southern CA many, many years ago. The floor plans in the pics I'm seeing are the same, the kitchen the same. Oh Eee Ohh! I totally agree with you. I much prefer how you had the home decorated. I can just "read" her thoughts...make it plain and simple so that they can see the bones of the house and that nothing personal interfers with someones decision on the house. I remember hearing I should remove all family pictures, remove excess furniture, blah, blah, blah. I wonder if this is how she really has the house or if this is the "for sale" version. Your way is MUCH more homey and appealing to me. It was beautifully done! 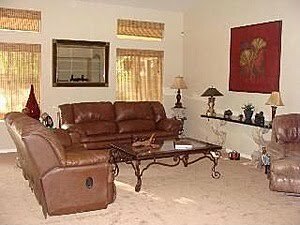 Your pictures would have "sold" me -- much quicker than the newer ones -- the new pictures almost makes it look like the owner has already moved out and left a few things behind. Yours was so much more homey! Well I can clearly see why she wanted it and bought it BUT I am wondering how she expects to sell it looking like it does with her choice of decor... By far, yours was better and more desirable to most buyers. It looked much warmer with your things in it. The kitchen really looks empty in their picture. I haven't been back inside any of our past homes (there have been 4). We did drive by one of our houses and the people that bought it put all those "things" in the yard. Wishing wells, wooden people hanging in the tree, deer, little people...it was awful. Interesting post, Marty. Yes, I have visited all three of my former homes (how odd is that, but I'm still in the vicinity, more or less, and I'm friendly with the buyers of each. One has been sold on since, so I haven't seen it in 20 years, but that's okay. Each new owner put their own stamp on the houses, which is to be expected, but none was offensive, just not my taste necessarily. The last house I sold was renovated top-to-bottom, which it needed, so it improved dramatically. That was gratifying to see. I am a realtor (among other things), so I've had some experience with this and I have to say I'd have had NO trouble selling your house when you were there - it's warm and inviting. The new owners just took all the character and personality out of the place. It's okay, but it's possible to "undress" a house too much for sale. I think that's the case here. Yes, I like your decor so much better! This was a fun post! I'm wondering what my old house looks like! My former neighbors say it doesn't look so good outside! Wow! She must have been from the "minimalist" school of interior decorating!!!! I like your pictures much better. I would love to go back. Your decorating is definitely warm and lovely. I think this is one of the prettiest tables I've ever seen. The black adds elegance, but the yellow and polka dots really "happy" it up. I understand that most people need to take out a few things... especialy if it is cluttered. But, this house no longer looks warm and inviting. Just be glad that your decorating was so nice and inviting, and it helped make the sale. I think the owners listened too closely to their realtor, who probably told them to put away ALL decor and anything that gave their rooms any personality -- that's what so many tell clients. It's not home staging, it's home stripping! The theory is to make the house look as if no one lives there; how nuts is that? Or -- maybe with this decorator, it's a case of the shoemaker's children going barefoot --she does other houses, not her own. I DO like your look MUCH better. I'd love to see inside the house we sold almost 2 years ago, but maybe not...I've driven past and her curtains are hideous, they ripped out ALL my beautiful perennial borders, took down the original bronze 1918 porch fixture (arts & crafts style) and replaced it with a fixture from Home Depot. . . and the list goes on and on, so I'm probably better off not seeing! I've even had old neighbors call me and say, "Do you know what the new owners did?" sometimes it's best not to look! I'm very new to your blog. I'm still catching up on your older posts. These are "before and after" photos that I can't wait to show my DH. When I get to your "before" photos, I'll say to him, "Now, THIS is how I'd like our home to look!"